Butler lost its first and only game in SWBL play to Madison. Down 25-0 after the first half, Butler finally scored with touchdowns by Furrow and Sprecher. Coach Art Bussard and his Aviators bounced back a week later, taking out Milton-Union. DeHays scored the first TD, catching a beautiful pass from Musick. 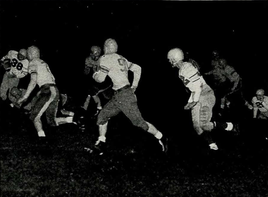 Howe scored the final TD for Butler, bulldozing his way through the center of the line. Eaton came to town for homecoming, and it was Furrow who got the scoring started with a TD reception from Musick. The duo teamed up again for the second score, followed by DeHays running the ball around the left end for his first touchdown of the night. DeHays would score his last TD of the evening with eight seconds remaining, courtesy of the old statue of liberty play. The boys from Randolph made their way across the dam and were sent home with a 32-18 loss. Furrow got the scoring started in a play that was talked about for years after, plowing through the line and into the Randolph secondary. A whistle was blown from the pressbox, signaling the end of the quarter, all of the players on the field froze, that was except for Furrow, who continued full steam ahead for the 70-yard touchdown jaunt. Butler downed Tipp in what was an absolute stalemate of a game, edging the Red Devils 19-18. The Aviators' first TD was a reception by Wead. Not long after, Musick connected again, this time with DeHays. Wead and Musick would hookup again late on the game winning touchdown. The win guaranteed Butler at least a share of the SWBL Crown heading into the Week 10 showdown with Northridge. The championship was Butler's second consecutive SWBL title. The highly rated Polar Bears proved to be a tough match-up for the Aviators, edging Butler 21-20. After a late score, Butler opted to play for the win rather than settling for the tie. Northridge stuffed the box and stymied the Aviators' two point conversion attempt, holding Butler just inches from the endzone. 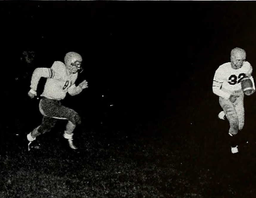 In the loss, Butler shared the 1952 SWBL Championship with Madison and Milton-Union, all of whom finished 4-1 in league play.